Visualizing biological cells under a microscope was just made clearer, thanks to research conducted by graduate student Yifei Jiang and principal investigator Jason McNeill of Clemson University's department of chemistry. With the help of Rhonda Powell and Terri Bruce of Clemson's Light Imaging Facility, the team was able to develop a nanoparticle "switch" that fluoresces to sharpen the resolution of microscopic images that depict small cellular structures. As recently published in Nano Letters, this switch improves upon an imaging method that won the 2014 Nobel Prize in Chemistry. Because cellular structures emit light at wavelengths smaller than 400-700 nanometers on the electromagnetic spectrum, they often appear blurred through a light microscope. This constraint is referred to as the diffraction limit, and it occurs because of the wave properties of light. As light passes around structures within biological cells, it diffracts, or bends, to a point that light microscopes cannot clearly resolve. The 2014 prize-winning imaging method - single molecule localization microscopy - was invented to surpass this limitation. 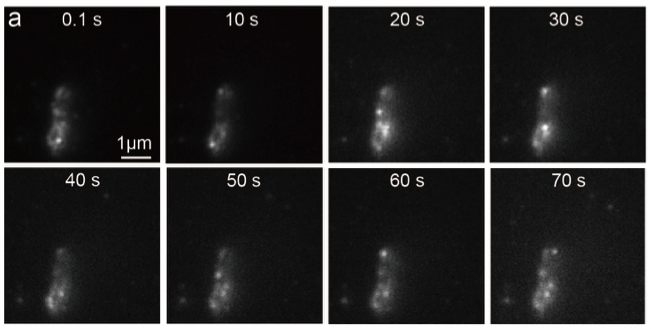 "Single molecule localization microscopy is based on molecular 'photoswitches' - fluorescent molecules that you can turn on and off, like a light switch, to beat the diffraction limit," McNeill said. "With this imaging method, the sample is imaged one fluorescent molecule at a time and a computer is used to construct an image that is much sharper than what you could get with a regular light microscope." The catch, however, is that the fluorescence provided by photoswitches is dim at best, with only a slight improvement in image resolution. Single molecule localization microscopy also requires specialized equipment that can be expensive to obtain. "These nanoparticles are the first photoswitches to achieve precision down to approximately 1 nanometer, which greatly improves the resolution of super-resolution imaging," Jiang said. "Also, our method only requires one excitation light source, where conventional super-resolution techniques require two lasers; thus, we have simplified the microscope setup." Jiang assembled the buckyswitch out of a fluorescent, semiconducting conjugated polymer complexed with a chemical derivative of buckminsterfullerene: a soccer-ball-shaped form of carbon. "The hard part of making a fluorescent nanoparticle that you can turn on and off is that there are lots of areas emitting fluorescence at once," McNeill said. "In the case of fluorescent conjugated polymer, there are dozens or hundreds of chain segments. You can try to make a lot of little switches for each segment, but it's hard to get them all to switch off at the same time. You can't get them synchronized." By adding the derivative of buckminsterfullerene, called PCBM, to the making of buckyswitches, a "master switch" is formed that regulates the atomic charge of the polymer's segments, thus synchronizing fluorescence. PCBM is able to seize electrons from the polymer segment, giving the segment an overall positive charge. This positive charge reduces the fluorescence of nearby segments, which has a domino effect that turns off fluorescence in the entire nanoparticle. Bruce - whose background traverses the topics of chemical engineering, applied biology, cell biology, and experience in teaching and industry - likens this imaging method to the view of a suspension bridge at night. "The wires of the bridge are often illuminated, and when you are standing far away from the bridge, the lights look like one continuous 'rope' of light, instead of individual bulbs. However, if you can make the bulbs blink - such that only every other bulb is 'on' at any time - your eyes can discern the individual bulbs from far away," Bruce said. "The basis for super-resolution microscopy lies in the ability to make fluorescent labels 'blink' just like the lights on the bridge. The work that Dr. McNeill's lab is doing is vital for the advancement of this technology because it focuses on making those individual blinks much brighter, so that our current photon detectors can actually see the blinks. If we can see the blinks with a camera or other photon detector, we can map where the blink occurs, and create an image where we can discern two points of light that are within 10-20 nanometers of one another." Once the buckyswitch was synthesized, Jiang tested it in E. coli, but not before developing a unique growth media for the bacteria. Typically, E. coli is grown in media that is autofluorescent, meaning that it naturally emits light. Without the proper media, the buckyswitch's fluorescence would be obscured by background light, something that Powell underlined. 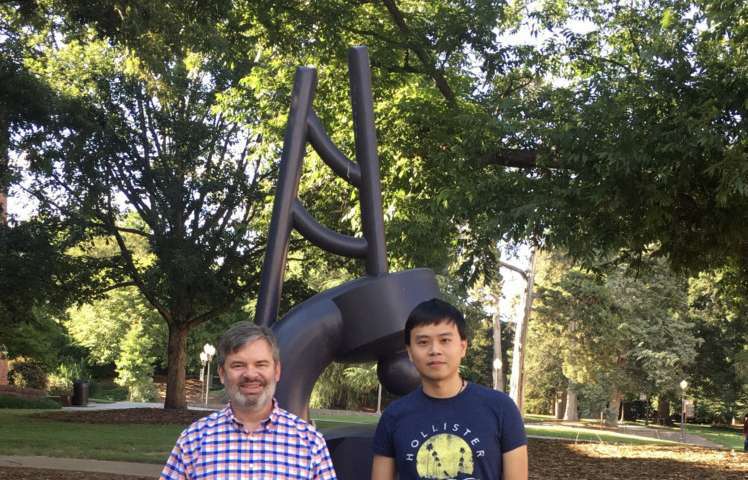 "A study like the one Yifei conducted required very little background fluorescence, so I researched media components that would be less likely to be autofluorescent and prepared a 'recipe' for a non-conventional, less autofluorescent nutrient media for bacteria culture," said Powell, who studied both biological sciences and microbiology at Clemson before becoming the research lab manager of the Clemson Light Imaging Facility. Powell and Bruce also worked to provide Jiang with the E. coli for the study. After all of the necessary components were squared away, Jiang attached the nanoparticle buckyswitches to the surface of E. coli. As hoped, the buckyswitches emitted small flashes of light, which allowed the researchers to determine their precise positions. They then pieced together each flash of light to reconstruct the shape of the E. coli, yielding a super-resolution image. "We hope this breakthrough will eventually be able to help researchers tackle difficult problems in biology, leading to breakthroughs in the understanding and treatment of disease," the Clemson team said. The team designed the buckyswitches to work with standard fluorescent microscopes and free software that's available online, making the technology inexpensive and accessible for labs worldwide. Their publication, titled "Improved Superresolution Imaging Using Telegraph Noise in Organic Semiconductor Nanoparticles," is featured in the June 14 issue of Nano Letters.